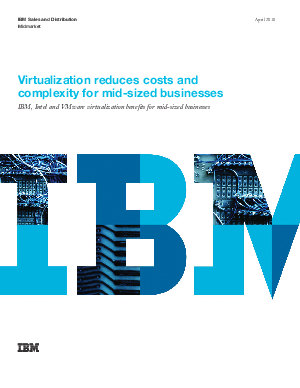 While the value of virtualization for large businesses has been well documented, this whitepaper from IBM explains how mid-sized business can benefit from virtualization with some new technologies and improved affordability. The paper explains virtualization in the context of mid-sized businesses and shows how they can reduce costs, improve services and simplify management. With specific examples of IBM solutions - and the cost savings you can expect - along with detailed explanations of the benefits of a virtualized infrastructure, the paper will help you understand the value of virtualization and begin discussion and planning for virtualization in a mid-sized business.